Linda Burton posting from Tuscaloosa, Alabama – “This is it. This is really truly it. 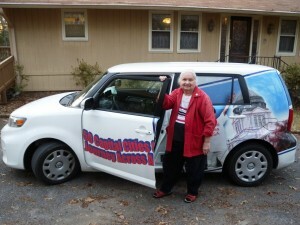 You have to get my picture one last time by the Scion,” I said to brother Craig. “Right here in the same spot as when I left 659 days ago.” I was feeling other-worldly at the moment, unreal, like I was Hillary at the top of Everest, or Amundsen at the South Pole. 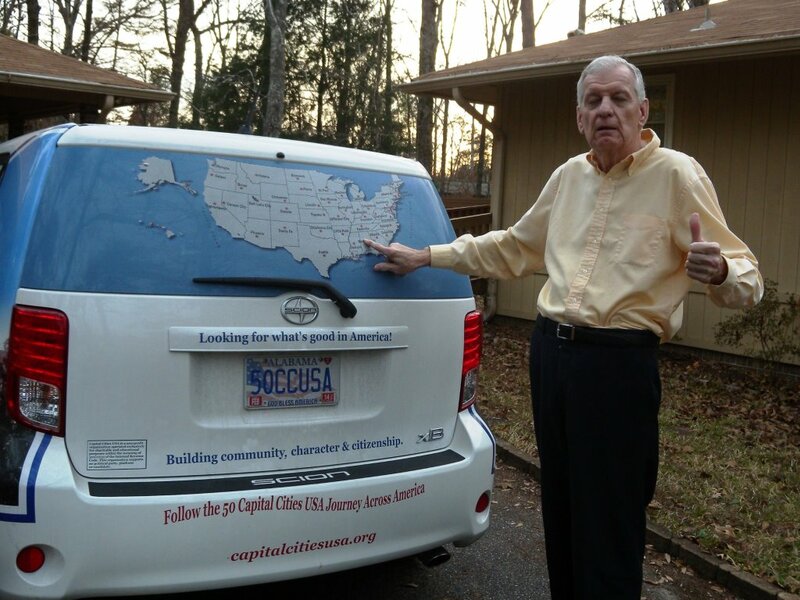 Or my friend Howard Cottrell, when he finally reached the last county in the United States. It took him 16 years to get to all 3,100 counties; it took Sherpas and sled dogs and some serious cold-weather gear to get to those extreme parts of the world. All I had to do was drive, and load and unload the car and the cats every two weeks. And re-establish a home and a workplace fifty times. I traveled 31,710 miles in all, according to my quick calculations last night. And I never varied from the course, I stuck with the plan. Where are the drum rolls, and the marching bands? Craig is laconic. No mushy-gushy stuff, no congratulations or wow-you-did-it praise. But he did take the camera and ask what angle I wanted. And he cooked spaghetti for me today (it’s our Christmas tradition – red spaghetti sauce and green salad). And he stored all my furniture and clothes in his basement for two years, and kept things safe. And last year he drove to New Orleans to spend Christmas with me there. So, yeah, he’s a primo brother, wouldn’t you say? I did my pose. 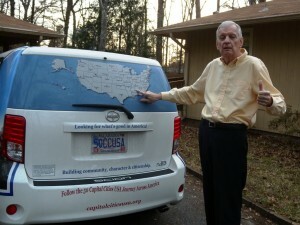 And had him stand by the car too, laconically pointing to Alabama on the map. The Journey Across America is officially over. I’ve been processing since I left Chattanooga and entered my birth state of Alabama yesterday; talking out loud in the car; thinking about the next phase of my life, and all the writing I will do. There was the quick-stop in Birmingham and lunch with cousin Emily at our favorite Cracker Barrel. I stopped in at my bank to let Jennifer know I really made it all the way; she and her sons have been following my posts. I stopped in at The Village, my old apartment complex, to do the same with Pat, and Shea, who excitedly waved good-bye on moving day last year. 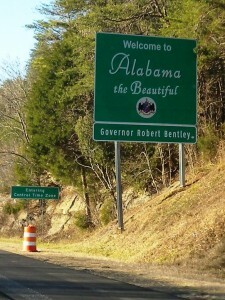 Then another hour’s drive to Tuscaloosa, home of the University of Alabama and my home in early-marriage years. I worked at a law firm there while hubby was in school; our first son was born there; brother lives just to the north, on Lake Tuscaloosa. It doesn’t look the same now; traffic is awful; streets have been widened into boulevards; hillsides have been taken over with sprawling complexes in brick and stone; the streets around the stadium are one-way. Football is responsible. Bear Bryant and Nick Saban and SEC championships. Roll Tide! 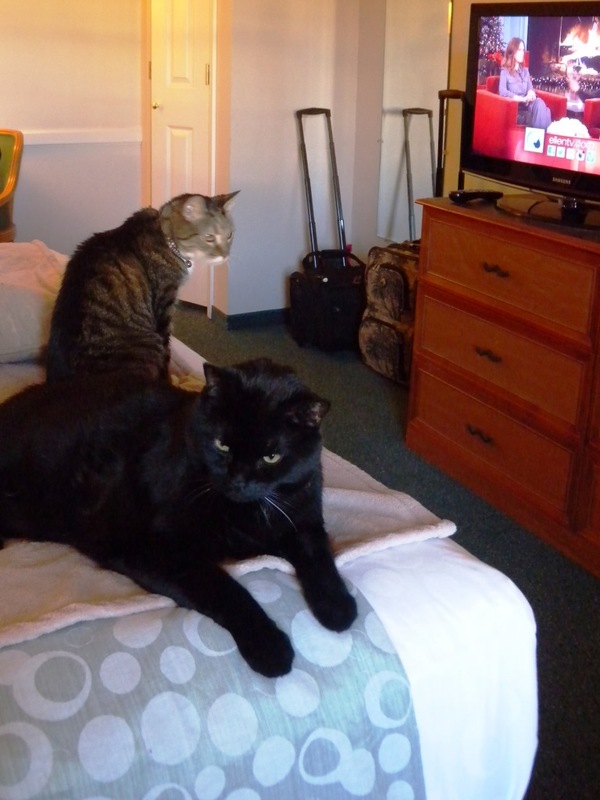 I chose a place near campus for my two-night stay; it’s easier with the cats. I left them peacefully curled on the bed with the TV on when I went out for dinner with brother last night. We picked the Cypress Inn, a beautiful spot overlooking the Black Warrior River, famous for its Hopping John and Fried Green Tomatoes. And the view, of course. They even have fishing from their pier, if you are so inclined. 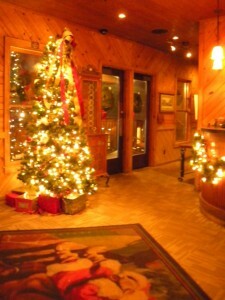 It’s a festive place; last night it was lit up for Christmas and filled with party-goers. 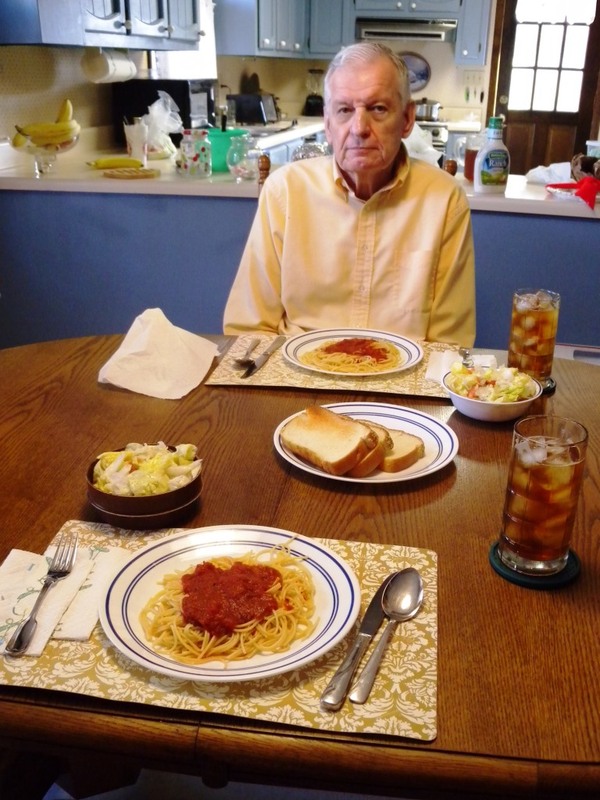 Then today, after picking up my mail at the UPS store and a quick-drive through campus, I relaxed at brother’s house, talking and reminiscing, eating spaghetti and nibbling on Christmas sweets; then, finally, photographing all my belongings in the basement. “I don’t even remember what I have,” I explained. “I need to relook at everything so I can think about what kind of house to get.” There’s my dresser, my bed, the sofa with the Alex scratches (it’s mine, I got here first, he never let Jack forget). All my pictures still sit neatly stacked in a closet; the file cabinets are still covered by plastic in the storage room. It’s a little overwhelming, I’ve been traveling light for so long. Today I can’t think about packing and moving. I just want to get to Arkadelphia, and find a house. Bye, Craig. Come see me soon. The Journey Across America is officially over. Next stop: Arkansas. Tuscaloosa, founded in 1819, was Alabama’s capital city from 1826-1846, before the capital was moved to Montgomery. Parts of the old capitol remain in a downtown park. “Tuscaloosa” comes from the name Tuskaloosa, chief of a Muskogean-speaking people. They battled and were defeated by Hernando de Soto in 1540 in the Battle of Mabila.